Dette er en oppgave som dreier seg om Karibien og India. Oppgaven som ble gitt var å diskutere kultur og samfunnsforhold i flere engelskspråklige land utenfor Nord-Amerika og de britiske øyene. Diskusjonsoppgaven begynner med å redegjøre for Karibien, for deretter å ta for seg India. The Caribbean is a great area located south of North America, north of South America and east of Central America. It consists of more than 7000 islands, most of the islands are not populated. Some of the nations are overseas dependencies or territories of countries such as the US and the UK, while some are independent. The islands are also called the West Indies, as Christopher Columbus thought he had come to India when he arrived in 1492. 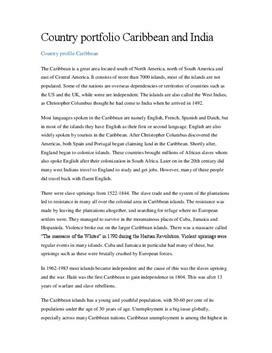 Most languages spoken in the Caribbean are namely English, French, Spanish and Dutch, but in most of the islands they have English as their first or second language.